An expanded and revamped Israel Museum re-opened to the public in late July after three years of renovations. While the modest architecture remains as it was, the modernist cubes rolling with the Jerusalem landscape, the jumble of buildings has been streamlined: 25,000 square feet of exhibition space have been added, but the number of items on display has been reduced by a third. Overall, the design is significantly more user-friendly, with a spacious new entrance hall leading to the museum's remarkable collections, including its three most significant wings: archeology, Jewish art and life, and fine art. Universalism at the Heart of the Universe Felice Friedson, gantdaily. In an interview, the director of the Israel Museum explains why Jerusalem is the most fitting place to make a statement about universality. The Place of Art Ellie Armon Azoulay, Haaretz. To Yigal Zalmona, a museum’s purpose includes being critical of government, of society, and of its own ties to wealth and other material factors. The thinking behind the redesign is anything but purely functional. James Snyder, the museum's director, has deliberately given the institution a stamp of multiculturalism. Hybridization is celebrated from the get-go: the corridor leading to the entrance hall is lined with a 6th-century C.E. mosaic floor unearthed in a Jewish public building and depicting Odysseus on the Nile: as neat a pagan/mythological/Jewish artifact as you're likely to find. Similarly, although the materials of Jewish history play a prominent role, they do so often within a self-consciously "universal" context in which their distinctiveness tends to become submerged. Thus, the renovated archeology wing, with its collection of Jewish artifacts that includes the oldest known copy of a biblical text, begins with the 1.4-million-year-old bones of a prehistoric bull and concludes with the Ottomans. In one of the most significant changes, the museum has added a permanent gallery of Israeli art. This might be seen as confirming that, a century after the founding of the Bezalel School of Art and Design, Israeli visual art has finally arrived. And even if Israeli art isn't one's cup of tea, one can welcome the ongoing revival of a nation that has opened its eyes and is taking pleasure in looking. Yet the gallery's plan, organized in terms of artistic responses to the question of Israeli identity, might seem rather to indicate that the reborn nation is less interested in looking around than in staring at itself in the mirror. And what does it see? Three triptychs hang in the gallery's main hall, each representing a different way of comprehending what it means to be Israeli. Mordechai Ardon's Gates of Jerusalem engages in a dialogue with Jewish tradition; Reuben Rubin's First Fruits evokes the physicality of the local landscape; Yosef Zaritsky's untitled work suggests an abstract cosmopolitan impulse without any connection to the Jewish past and with only a tenuous link to the land. The logic is explicated by Yigal Zalmona, the museum's curator-at-large, whose learned and massive volume, 100 Years of Israeli Art, was issued to coincide with the opening. Proceeding chronologically from the founding of Bezalel to the present, Zalmona concludes the work by hailing the emergence of a multicultural Israeli reality in which identity is grasped as . . . a question. At the museum, the most revealing insight when it comes to Israeli art is one unintended by the curators. 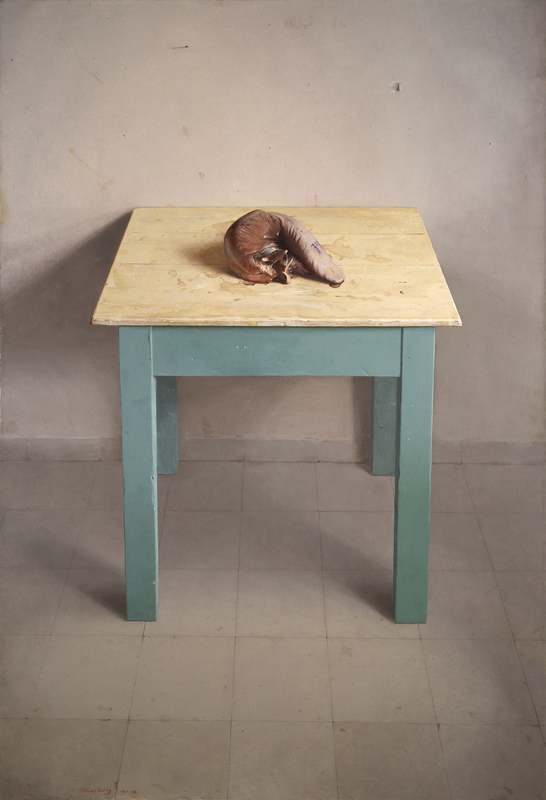 Next to Ardon's "Jewish painting" hangs Israel Hershberg's Cow's Tongue; directly across from it, next to Rubin's landscape, one encounters an untitled collage on plywood by Rafi Lavie. At first glance, no two artists would seem to be more diametrically opposed. Hershberg is a figurative artist engaged in a serious dialogue with the Western tradition, while Lavie's art originates in his personal tastes. From another perspective, however, both Hershberg and Lavie are responding to the absence of an authentic Israeli artistic tradition. The difference is that Hershberg regards the absence as a problem, while Lavie considers it an opportunity for unbridled individual expression. As for the curators, intent on pushing their multiculturalist point of view, such merely artistic questions seem to be of little interest. The newly renovated Israel Museum, with its beautiful landscape, vast collection, and fascinating exhibits, all arrayed for easy access and comfort, is a national boon. One wishes one could say the same of its celebration of Jewish identity as a porous and open-ended question. The multicultural answer to that question is, at best, transitory, and by definition the disparate elements it seeks to embrace cannot be absorbed into a unified whole—which may be one reason why the effort seems always to end in solipsism. Of course, the Israel Museum is not alone in this respect. These days, the idea of Judaism as a civilization open to the best that has been thought and said while remaining its own distinct and unified whole lives mainly in old books, and the revamped Israel Museum is nothing if not a creature of these days.